Spring and summer are exciting for many people, thanks to the revitalizing warm weather and all the fun outdoor activities that come with it. For a child with seasonal or environmental allergies, however, they are likely dreading the oncoming months of coughing, sneezing, and other unpleasant symptoms. Fortunately, there are several steps that you can take as a parent to help them breathe more easily. The first step to tackling your child’s allergies is to fully understand their triggers. As we mentioned in our allergies 101 blog, there are different kinds of allergies that can come with different symptoms. 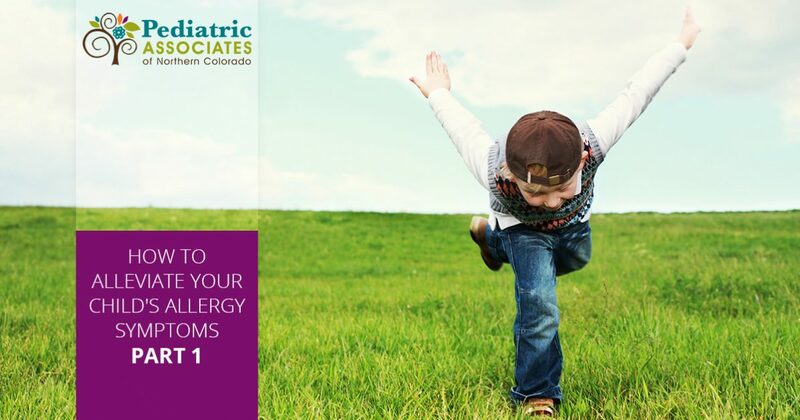 The Pediatric Associates of Northern Colorado can help you narrow down the list with environmental allergy tests. Call today to schedule your appointment at our Fort Collins office and keep reading for tips on how to minimize your child’s allergies! Once you know what know what your child is allergic to, you can specifically target their triggers. Everyone’s body reacts to different allergens in a different way, but there are a few common denominators among childhood allergies. For today’s post, we picked two typical triggers and listed steps you can take to minimize those specific allergens. Pollen is a powdery substance that plants spread in order to reproduce. If you learn that your child is allergic to a specific plant, such as ragweed or species of grasses or trees, then you can help reduce their symptoms by keeping an eye on the pollen count for that particular plant. When the triggering plant is in bloom, keep your child inside as much as possible and keep the windows of your home shut. They should also shower or bathe before bed to get rid of any lingering pollen on their clothes and prevent it from spreading to their bedsheets. The pollen count for different plants will peak at different times, which can be helpful in anticipating when you need to take these steps. In addition to peak months, there are also peak times, so you may be able to plan outdoor activities to avoid those times. Grass and weed pollen may peak in the morning, for example, so you can schedule play dates or summer camps for the afternoon or evening. If your child is allergic to dust mites, keeping them inside may actually worsen their symptoms. Dust mites are very tiny bugs that thrive inside your home, and they are a very common trigger for allergies or asthma. You’ll have to thoroughly clean your home if you want to minimize your child’s exposure. Try to clear their room of anything that might harbor dust mites, such as thick curtains, rugs, or carpeting, as well as fuzzy blankets, comforters, stuffed animals, and books. Making your home cool and dry with the help of your air conditioning can help diminish the dust mite population, as will washing your sheets and towels in hot water once a week. Pollen and dust mites are two very common triggers, but there are plenty more seasonal and environmental allergens out there, so we will continue our conversation on reducing your child’s allergy symptoms in a later blog post. 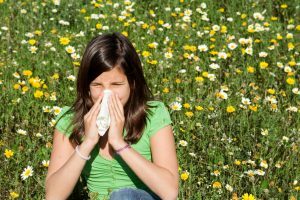 If your child is expressing any of the symptoms we discussed in our previous post on allergies, then make an appointment with the Pediatric Associates of Northern Colorado and we can provide a fast, effective environmental allergy test. We can also help you find ways to fight your child’s uncomfortable symptoms, such as through sublingual immunotherapy. Check back in for future posts about those solutions and call your child’s pediatrician today to discuss your options!